The San Francisco Giants World Series victory parade kicked off officially a little after noon Friday with loud cheers, confetti, marching bands and the Giants themselves, sending tens of thousands of fans lined up on Market Street into giddy fits of excitement. Hundreds lined up in the wee hours of Friday morning, hoping to grab the best spot to catch a glimpse of MadBum, Panda and Pence. The parade started at Steuart and Market streets, ending with a celebration at the Civic Center Plaza and City Hall. "Yes! Yes! Yes! we did it," Mayor Ed Lee said to excited crowds in front of City Hall. "This is a story that will grow to be legendary ... Is MadBum a man or a machine? Is there anything I can do to keep Panda in San Francisco?" Handing Giants coach Bruce Bochy the keys to the city, Lee declared Oct. 31 as "San Francisco Giants Day." "I want to tell them thanks for being warriors," Bochy said of the Giants, who went from being a wild cards to World Series champions this year. Crowd favorite Pablo Sandoval, who inspired a giant panda floating above the enthralled parade masses, is a free agent now "I want to be here every two years," Sandoval told NBC Bay Area's Terry McSweeney earlier during the parade. 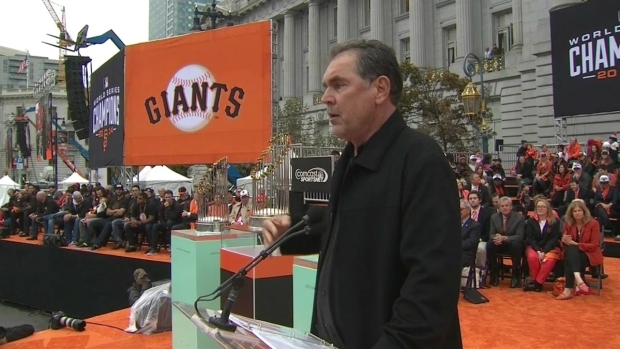 Bruce Bochy addresses the crowd gathered in front of San Francisco City Hall, Friday, Oct. 31, 2014. "Let's see you back here next October," said Giants CEO Larry Baer to cheering crowds at City Hall, his team's three World Series trophies next to him. 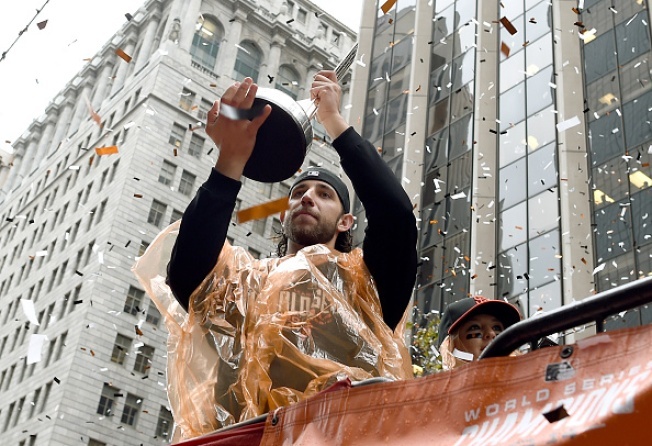 The crowd, swathed in orange, black and white, went wild when they spotted the star of the moment — Madison Bumgarner, MVP of this year's World Series, in the parade. Jockey handed out special "MadBum" underwear to fans in his honor. "It's a team effort all the way," a humble Travis Ishikawa told NBC Bay Area's Bob Redell, who was able to catch a ride on the Giants' victory double-decker bus for a bit. "How does it feel to be up here?" Redell asked Giants catcher Buster Posey. "Feels great," Posey replied smiling. Giants pitcher Sergio Romo — who caused a stir during the 2012 parade for wearing a "I just look illegal" t-shirt — was spotted making a "three" sign, signifying his three World Series rings. This year, his t-shirt read "I have issues." "Very exciting to see we made this city happy again — we love our fans so we are very very blessed to bring another ring to them," said Giants pitcher Jeremy Affeldt. "A lot of familiar emotions — feels good to be part of another celebration," said Tim Lincecum. Barry Bonds rolled by in a Giants-themed convertible, waving to the crowd, who chanted his name. Giants' legends Juan Marichal and Willie Mays also took part in the parade, as did Steve Perry and Metallica. "This is unbelievable, this gives you goosebumps," said Giants player Michael Morse. Giants' outfielder Hunter Pence and Brandon Crawford waved to the crowd from their bus. Pence, who looked like he was having a lot of fun sporting a WWE title belt, chanted his famous "Yes! Yes! Yes!" and tweeted: "Best fans in the world!" 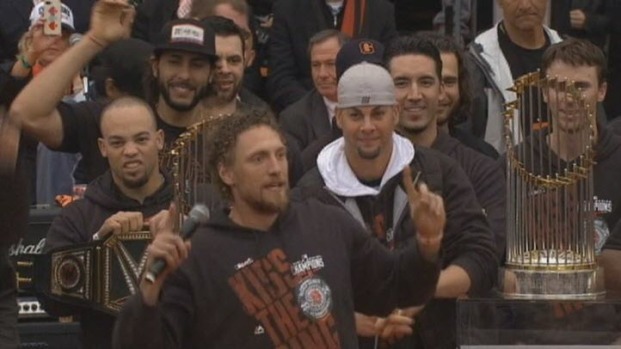 San Francisco Giants outfielder Hunter Pence addresses the crowd during the 2014 World Series victory ceremony. "This never gets old," one fan told NBC Bay Area. Hearty San Franciscans — wearing Panda caps and holding Pence signs — and even guests from beyond, didn't seem to mind hoisting up their umbrellas and hunkering down in rain coats to watch their beloved baseball team bask in the glory of their third World Series win in the last five seasons. City officials expected one million people to come out for the event. BART and Muni added extra service for hundreds of thousands of extra riders heading into the city. BART spokeswoman Alicia Trost said there were 10,000 extra morning riders Friday morning. Police also added extra patrols. NBC Bay Area's Riya Bhattacharjee, Lisa Fernandez, Bob Redell, Terry McSweeney and Janelle Wang contributed to this report.